Hand made pasta, cooked to perfect al dente. 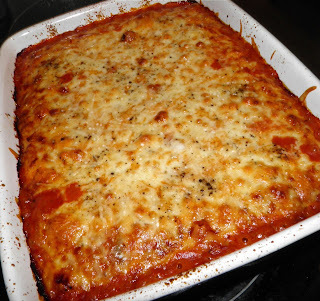 Manicotti are large extruded pasta tubes that are stuffed and baked. You can buy the tubes in any grocery store. They’re a bit of a pain to fill. 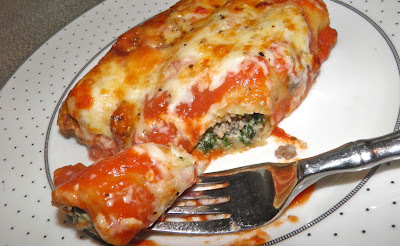 But have you ever heard of hand rolled manicotti? A sheet of pasta is just as good and oh so much easier to stuff. 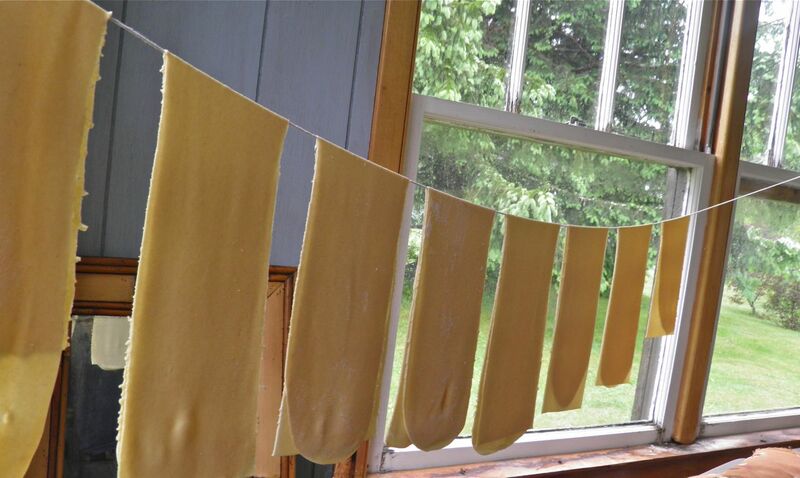 And if you use fresh pasta, as opposed to dried, you don’t even have to pre boil them. Just make, roll and bake. Pasta making is fun. It’s one of those satisfying activities that make you really feel like you’ve done something special. It’s a real treat, and really not a lot of work. But many Italian mothers and grandmothers (and I would imagine dads and grandfathers) have made do without one for centuries. I bet doing so builds muscle as well as character. 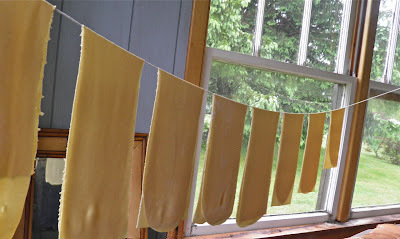 I find a necessity to making springy, delicious homemade pasta is to use at least part durum flour. It’s stiffer to deal with, but that’s the point. You need that al dente bite. Personally I don’t like using 100% durum wheat. It’s a little too stiff to easily deal with. For me that’s best left for commercial pasta. You can buy as little (or as much) durum wheat flour as you want/need at bulk food stores. Way cheaper than the grocery. Since this one’s a little involved today, let’s just get to it. Time doesn’t include making the pasta. You can use tubes or purchased fresh sheets. But I do have to say the homemade pasta worked amazingly well. that well. It kind of looks like I was washing chamois! To make the pasta, mix together the two flours with the salt in a bowl. Whisk together the yolks, 1/2 cup of water and oil. Pour the egg mixture over the flour and slowly start to whisk the two together with a fork. Once you can’t whisk any more begin working it with your hands. Add only enough water to bring it together. It may be the additional 1/4 cup, it may not, it may be slightly more. Moisture content in flour varies by the day, but the needs to be quite stiff. Knead the dough on the counter until smooth. Wrap tightly with plastic and let rest for at least 1/2 hour. Then cut into 4 pieces and roll (either by hand or machine) into long sheets. If using a machine only roll to setting #6. Only use enough four while rolling, if you need any, so that the sheets don’t stick together. Hang to dry for about 1 hour. Then cut into pieces about 8"-9” long x 4”-5” wide. If using a pasta machine the sheets will be the width of the roller, which is about 4”-5” wide. Heat the oil in a large sauté pan. Sauté the onion and garlic for 3-4 minutes. Then add the hamburger and cook until no longer pink. Remove from the heat and stir in the spinach, ricotta, egg, 1/2 cup of the parmesan, oregano and some salt and pepper. Let sit until cool enough to handle. Preheat the oven to 375°F. Oil a 9” x 13” (or about) ovenproof pan. 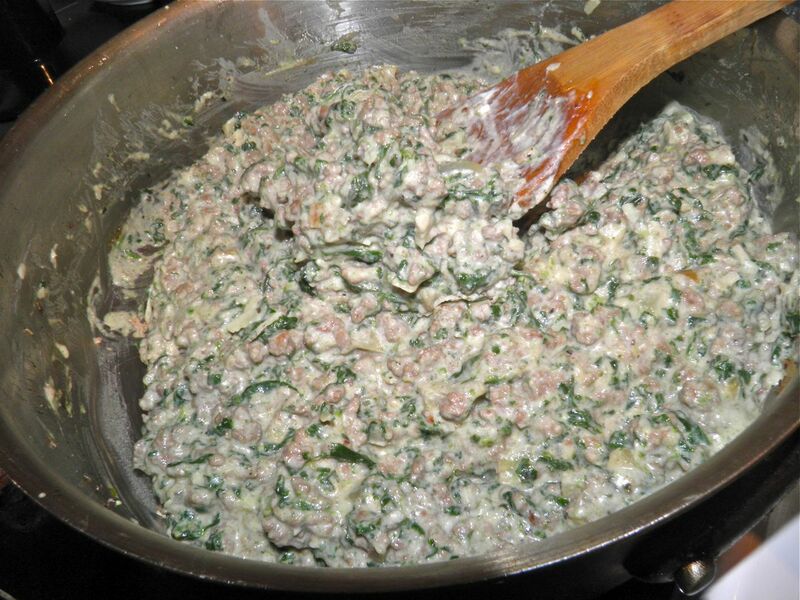 Place about 2-3 tablespoons of filling on the short side. 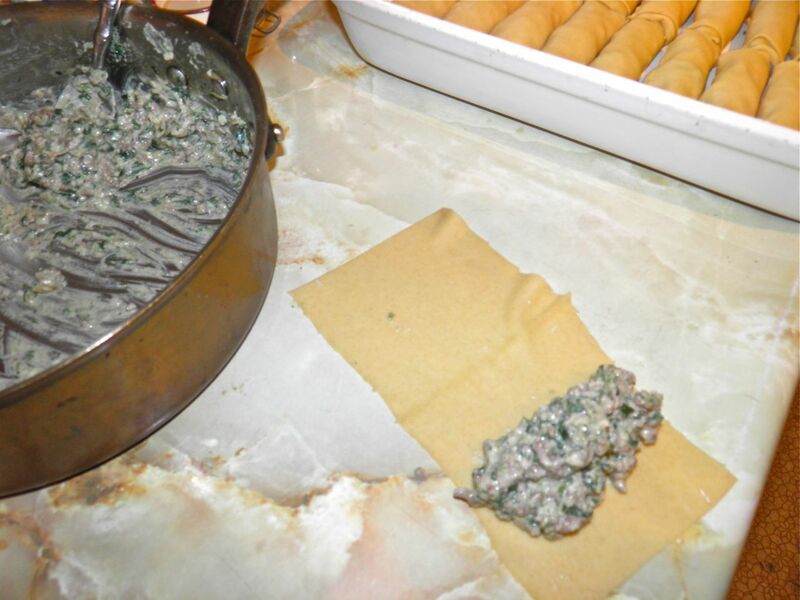 Roll up and arrange the manicottis in the pan. Mix any little bit of leftover filling into the pasta sauce. Pour the sauce over the manicotti. Since fresh pasta is uncooked the manicottis need to be covered. 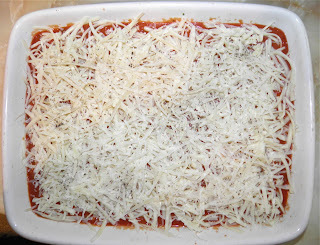 Sprinkle the top with the mozzarella and remaining 1/2 cup parmesan. Bake for 50-60 minutes, until the dish is browned on top and the sauce is bubbling in the centre of the pan. Let cool slightly before serving. A nice accompaniment is a fresh green salad with a vinaigrette.